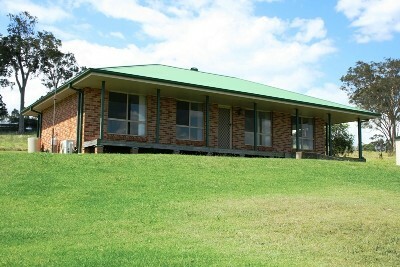 Our Ref 10H: Well presented brick home conveniently set on 5 acres right on the edge of Dungog. * 3 bedrooms (2 with built-ins). * Practical kitchen with dining area. * Spacious living area with split system air conditioning. * Double garage with toilet, shower and power * Fully fenced with 1 stock dam and town water * Low maintenance block with striking rural views Enjoy all the benefits of country living with the convenience of Town facilities close by.